Leigh Dones Moss - Resnick Law, P.C. Leigh Dones Moss has spent more than 20 years concentrating her practice advising clients in business law, bankruptcy and probate matters. 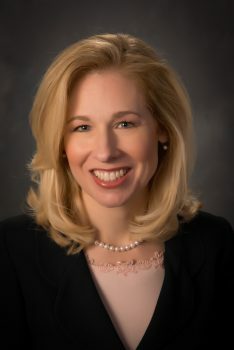 Over the course of her two decades at Resnick Law, Leigh has developed a reputation amongst her peers and clients as a zealous legal advocate. Her in-depth knowledge of legal trends and applicable case law helps businesses and individuals achieve their goals both in and out of the courtroom. Splitting her practice between business law and bankruptcy, Leigh represents and advises clients with buying and selling businesses and assists business owners with their day-to-day needs. Leigh actively works with her clients on business formation and operation, employment issues, drafting contracts and other corporate matters. Leigh is also an experienced litigation attorney and she aggressively represents her business clients in contract and business litigation matters when needed. In issues involving Bankruptcy court, Leigh is an experienced counselor for both debtors and creditors. Possessing extensive knowledge of both debtor and creditor rights, debt settlement and workouts, Leigh is one of Resnick Law’s most sought after attorneys regarding bankruptcy matters. Additionally, while recognizing that bankruptcy may be the only answer for certain clients, Leigh prides herself on providing clients with “Solutions Without Bankruptcy” whenever possible. Her extensive experience within the bankruptcy field allows Leigh to provide clients with financial strategies to avoid the filing of a bankruptcy case and to aggressively represent clients in settling their debts.